A few pix from around town, in our occasional photo feature: First, a reader sends in this view of the curious paint job now in progress on the original Ruggles Grill on Lower Westheimer. The mosquito artist: Garro. Last we checked, the building on the corner of Westheimer and Grant had been identified as the Houston landing site of Austin sushi favorite Uchi. 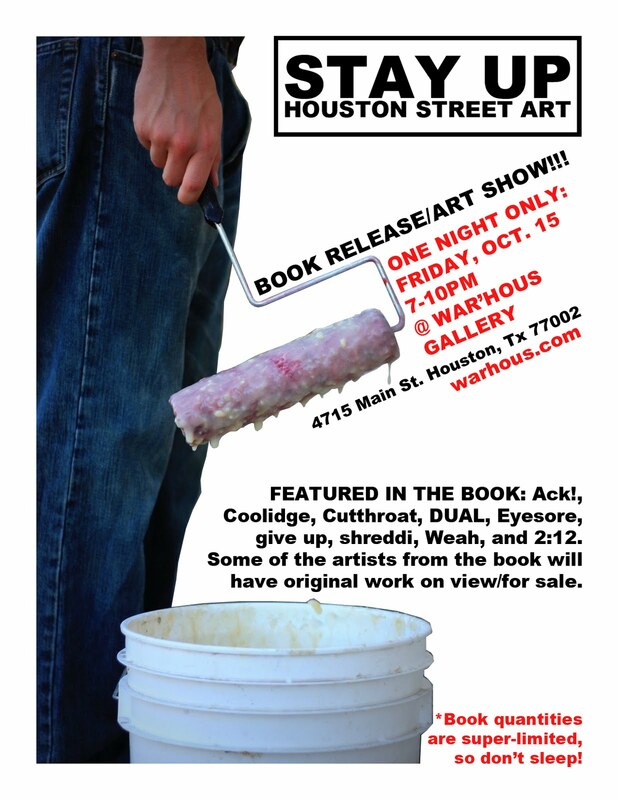 Elizondo’s new book on Houston street art, Stay Up, features photos of the handiwork of 9 local graffiti and wheatpaste craftspersons, and debuts tomorrow at a signing party tomorrow night at War’Hous. Previously on Swamplot: Montrose Uchi To Be an Uchi; No Plans To Crush Felix, Lost Felix, Discovered Sushi: Austin’s Uchi Coming to Montrose, Where the Freeway Met the Bayou: The Last Days of Las Alamedas, Las Alamedas: Landlord Wants More, Las Alamedas Lease Lapsed? I live near this Ruggles, they had just repainted this building from blue to the now Halloween colors. I am surprised that they are painting it again. Someone must have complained about how ugly the new colors were.